While in Puglia you cannot miss a visit to Lecce, the baroque capital of the south or Gallipoli, a quaint fishing village on the Ionian Coast. Gallipoli's name comes from the Greek “Kalle Polis”, which literally translates to "beautiful city". In Lecce we will tour the sprawling town center, visit the incredible churches and the Roman amphitheater. In Gallipoli, we will wander through the amazing maze of alleys, visit the Cathedral as well as an underground oil mill dating back to the 14th century. Optional lunch at fantastic fish restaurant Puritate in Gallipoli (55 Euros extra) and/or winetasting at Schola Sarmenti in Nardo' (20 Euros extra). After lunch we can stop for coffee at one of Gallipoli's amazing beach clubs. Departure from your hotel at 9.00 am, return at 6.30 pm. Tuesday: Tour of the Salento Wineries. Price €195 euros per person, including lunch at one of the wineries. Visit two wineries in the Primitivo / Negroamaro area of Salice Salentino and taste their award winning wines and delicious food. For an extra 30 Euros per person, it's possible to add a third winery or spend one hour on the sandy beach of nearby Porto Cesareo. We can also add a quick tour of Lecce. Departure from your hotel at 9.00 am, return at 4.30 pm. Wednesday: Matera. Price €175 Euros per person, including entrance to museums & churches. A must-do if you're in Puglia is head less than two hours west to the incredible town Matera in Basilicata. A visit to the famous "Sassi" (cave dwellings) of Matera, which are now protected under the Unesco World Heritage Site, allows you to step back in history. Matera is said to be one of the world's oldest towns. Your first glimpse of the "Sassi" will leave a lasting impact. Haunting and beautiful, the Sassi sprawls below the rim of a yawning ravine like a giant nativity scene. Although many buildings are crumbling, others have been restored and transformed into cosy abodes, restaurants and cave hotels. Optional memorable 3 course lunch at amazing "Falco Grillaio" or "Gatta Buia" in Matera (40 Euros extra), "Abbondanza" (55 Euros extra). Departure from your hotel at 8.30, return at 6.30 pm. Thursday: Cisternino, Alberobello and Polignano. Price €155 euros per person, including entrance to museums. Alberobello the only town in Puglia entirely built of the famous trulli. It is also a UNESCO World Heritage Site and a incredible place to explore by foot. 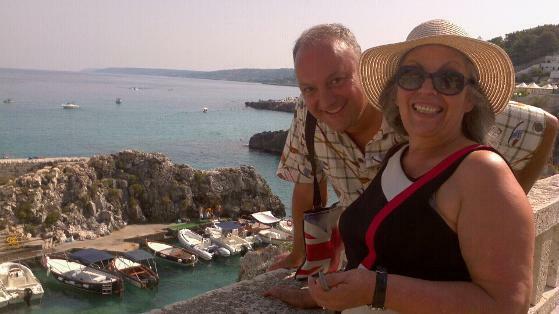 Next we'll visit the breathtaking Polignano a Mare, which is an amazing medieval town clinging to the Adriatic cliffs. We'll end the day in quaint Cisternino, a white washed town in the Itria Valley with dreamy alleyways and sweeping views of the valley. Optional 3 course lunch at family-run "Cantina" in Alberobello (n.1 on Tripadvisor, extra €50 Euros) and/or a winetasting at the Wine Museum of Cantina Albea (20 Euros pp). We can also add an optional 2 hour boat tour of the caves of Polignano for an extra €35 euros per person. Thursday: Visit Alberobello ONLY for a half day tour (9am to 1pm) from Ostuni at €95 Euros per person. Thursday: Visit Polignano a Mare for a half day 2pm to 6pm from Ostuni at 95 Euros per person. Optional boat excursion to see the caves of Polignano for €35 per person extra. Friday: Lecce and Gallipoli. Price €165 Euros per person, including ticket to museum. Saturday: Trani & Castel del Monte. Price €195 Euros including ticket to the castle and guided tour. Sunday: Lecce, Otranto & Castro. Price €175 Euros per person. Otranto is famed for its cathedral with fantastic mosaics, as well as for its medieval castle that inspired Horace Walpole's novel. We will visit this seaside town from where crusaders and knight templars would leave for the Holy Land. Optional lunch at "Pizzica" in Castro, a small and fascinating fishing village, or at Tricase's "Anime Sante" run by local fishermen (50 Euros pp). Optional boat excursion from 45 Euros pp. Departure at 9.00 am, return at 6.30 pm. Note: As mentioned above, we offer optional lunches at award winning restaurants for €40 to €55 per person, wine is included. Visits to award winning wineries ranges between €20 - €30 per person. Above pricing refers to departures from Ostuni, Alberobello, Lecce, Monopoli, Polignano a Mare, Brindisi, Ceglie Messapica, Cisternino or Martina Franca. 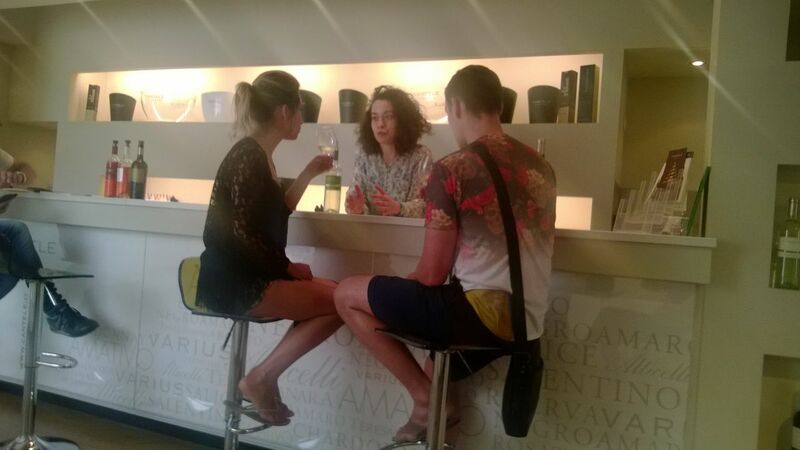 We also offer cooking courses including lunch or dinner plus wine tasting from 125 Euros pp. Please inquire. 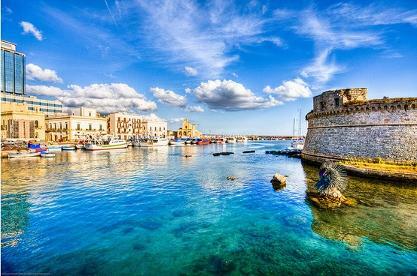 Gallipoli, from the Greek Kallipolis meaning beautiful city, is a fishing village on the coast of southern Puglia. Gallipoli's Old Town, built on an island now connected to the mainland by a bridge, is picturesque and a nice place to stroll through its maze of alleys. The 17th century Baroque Sant' Agata Cathedral is in the center of the town. Several interesting churches are along the perimeter of the old town facing the sea. The walls and bastions surrounding the old town are believed to have been built in the 15th century to fend off attacks, especially from pirates. The walls were altered in the 19th century permitting beautiful views of the sea, port, and harbors. The Hypogeum Oil Press at Palazzo Granafei was a major center for producing lamp oil. The pretty port is still used by fishing boats and you'll see fishermen mending their colorful nets and houses decorated with fishing baskets. Restaurants serve fresh seafood and sea urchins are a specialty of Gallipoli. Castello Angioino stands near the entrance to the old town. The current fortress, built on old Byzantine fortifications, probably originated in the 11th century but was altered quite a bit in the 15th century. The fortress guarded the old port, once part of an important trade route, and was connected to the mainland by a drawbridge. Approach Matera from virtually any direction and your first glimpse of its famous sassi is sure to stay in your memory forever. Haunting and beautiful, the sassi sprawl below the rim of a yawning ravine like a giant nativity scene. The old town is simply unique and warrants at least a day of exploration and aimless wandering. Although many buildings are crumbling and abandoned, others have been restored and transformed into cosy abodes, restaurants and swish cave-hotels. On the cliff top, the new town is a lively place, with its elegant churches, palazzi and especially the pedestrianised Piazza Vittorio Veneto.